The rediscovery of a mystery animal in a museum’s underground storeroom proves that a non-native ‘big cat’ prowled the British countryside at the turn of the last century. The animal’s skeleton and mounted skin was analysed by a multi-disciplinary team of scientists and researchers at Southampton, Durham, Bristol, and Aberystwyth universities and found to be a Canadian lynx – a carnivorous predator more than twice the size of a domestic cat. The research, published today in the academic journal Historical Biology, establishes the animal as the earliest example of an “alien big cat” at large in the British countryside. The research team say this provides further evidence for debunking a popular hypothesis that wild cats entered the British countryside following the introduction of the 197 Wild Animals Act. The Act was introduced to deal with an increasing fashion for exotic – and potentially dangerous – pets. The academics believe such feral “British big cats” as they are known, may have lived in the wild much earlier, through escapes and even deliberate release. There is no evidence that such animals have been able to breed in the wild. Co-author of the paper Dr Darren Naish, from the University of Southampton, says: “There have been enough sightings of exotic big cats which substantially pre-date 1976 to cast doubt on the idea that one piece of legislation made in 1976 explains all releases of these animals in the UK. 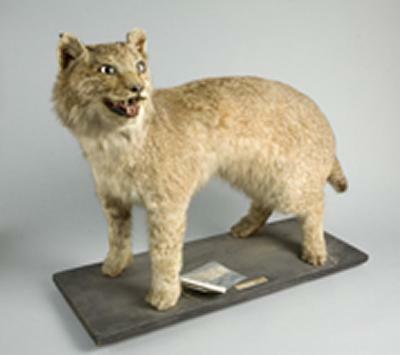 The study of the Canadian lynx, rediscovered by research team member Max Blake among hundreds of thousands of specimens at Bristol Museum and Art Gallery, details records unearthed at the museum which showed the animal had originally been mislabelled by Edwardian curators in 1903 as a Eurasian lynx – a close relative of the Canadian lynx. The records also showed that the lynx was shot by a landowner in the Devon countryside in the early 1900s, after it killed two dogs. “This Edwardian feral lynx provides concrete evidence that although rare, exotic felids have occasionally been part of British fauna for more than a century,” says lead researcher, Dr Ross Barnett, of Durham University’s Department of Archaeology. The researchers point out in their paper that Eurasian lynxes existed in the wild in Britain many hundreds of years ago, but had almost certainly become extinct by the 7th century. Laboratory analysis of the Bristol specimen’s bones and teeth established it had been kept in captivity long enough to develop severe tooth loss and plaque before it either escaped or was deliberately released into the wild. Ancient DNA analysis of hair from the lynx proved inconclusive, possibly due to chemicals applied to the pelt during taxidermy. Dr Greger Larson, a member of the research team from Durham University and an expert in the migration of animals, adds: “Every few years there is another claim that big cats are living wild in Britain, but none of these claims have been substantiated. It seems that big cats are to England what the Loch Ness Monster is to Scotland. The lynx is now on public display at Bristol museum.